In today’s bustling world, it’s easy to let something like pampering fall by the wayside. You might feel like a spa day is an unnecessary luxury, and in our workaholic culture, you might even feel guilty about taking time for yourself. However, you’re the only person in your life who is always going to be there, and it’s important to take time to make yourself feel special and loved. At our massage spa in Chelsea, we would love the opportunity to help you pamper yourself. Whether you are looking for a massage, facial, or our hair removal services, make like Donna and Tom and treat yourself! Is there anything more luxurious than a long bubble bath to yourself? 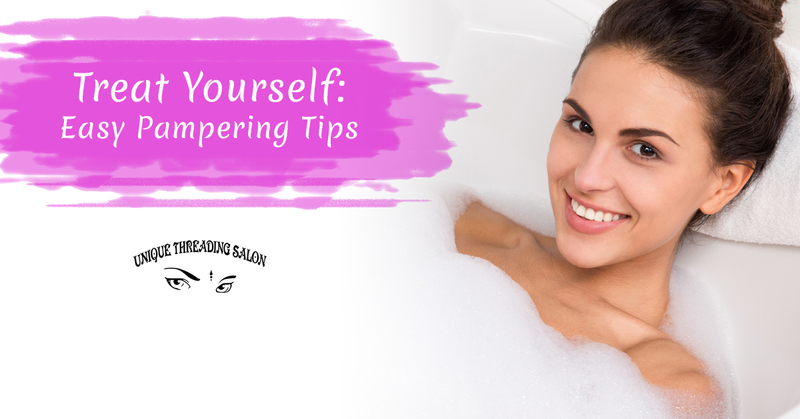 When it comes to pampering, a bubble bath is a classic choice that will have you forgetting about all the stressors of your day. Invest in some bubble bath with a relaxing scent such as lavender, and enjoy how soaking in the tub just seems to make all your troubles slip away. You don’t need anyone else to be there to enjoy a decadent dinner. If you like to cook, making yourself your favorite meal is a great way to treat yourself. Set the table, light some candles, and pour yourself a nice beverage to accompany your tasty supper. The best part of eating alone is, all the leftovers are for you! Is there a skill you have always wanted to learn but have never had the time? Now is the time to take the leap! Find a course you can take and go ahead and sign up. This will enrich your mind, and maybe even your social life. This one is particularly beneficial if you have been having any problems with your skin. Getting a professional facial not only feels incredible, but the esthetician can also make recommendations for your daily skincare routine. Pamper yourself here at Unique Threading Salon with our facials in Chelsea! Friendship is the balm to all of life’s woes. Has it been a while since you caught up with your BFF? Schedule some time with them, whether you grab a coffee, hit happy hour, go for a walk, or see a movie. Treat yourself to the love and attention of someone dear to you. There is something thrilling about going to a new place for the first time. Traveling to a different city, state, or even country can be a great departure, but you don’t have to hop on a plane to get the pampering benefits of exploring a new place. New York happens to be one of the most explorable cities in the country, so try walking around a new neighborhood, heading to a store you have never been before, or strolling around a new part of Central Park. When you’re ready to book your massage in Chelsea, we’re here for you! Contact Unique Threading Salon to schedule your appointment.